Do You Have a Green House? Sustainability, Green Cars, Organics and More..
Perhaps you want to do more to create a 'green house', reduce your carbon footprint or are thinking about a more fuel-efficient car. Yes, there may be a (short term) cost to 'going green' but the basis behind becoming more sustainable is about using less, and living smarter which saves us money and resources for the long term! Green News will keep you up to date with green events from festivals, politics and new green products that hitting the market. Celebrities have become in many ways the flag-bearers for the green movement, they have the money and clout to experiment with new green technologies that are not always available to the rest of us. If you're building a new home, or renovating for improved energy efficiency there are a myriad of options available to you whether it be in regards to passive solar design, heating, cooling, insulation and even producing your own power with solar panels. With a passion for community architecture and an organic gardener, still finding my feet, I hope to provide you with a wealth of resources to help you make environmentally friendly choices for your new or existing home. 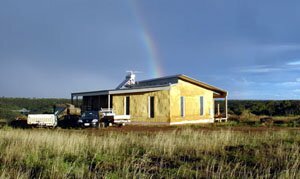 The journey also takes me closer to my hopes of building my own strawbale home, something that started as a dream in my days as an architectural student. Straw bale is not only a beautiful building material, it re-uses waste materials, is perfect for owner-builders, and has thermal values that are hard to beat. I'll be taking part in strawbale working bees and workshops. Getting 'down and dirty' so to speak, to get a feel for this construction method before I finalise the plans for my own home. I hope you enjoy the journey and learn as much as intend to! Looking for something in particular within Green House Healing? © Copyright 2007-2011 All rights reserved.